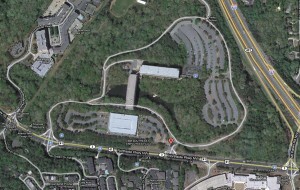 Aerial photo above shows the IBM tract off Northside Parkway that is the location for the new North Atlanta High School. Atlanta Public Schools has finalized the purchase of a 56.6 acre land parcel in Buckhead for construction of a new high school. APS’ share of the cost of the property is $55.3 million. IBM, which currently occupies the site, will pay $23.6 million to the former property owner, Jamestown Properties, to satisfy the remainder of its lease agreement, according to a statement released by APS. The new high school will replace North Atlanta High School. The newly refurbished North Atlanta High School will be converted to a middle school for the area, replacing Sutton Middle School. The new school is scheduled to open in August 2013. According to APS, which finalized the sale on Monday, plans are to retain many of the existing structures on the property, including a parking desk and lots and buildings. The total estimated cost of the project is approximately $100 million, including the cost of the land. Entry filed under: Education, Planning, Traffic. Tags: Education.